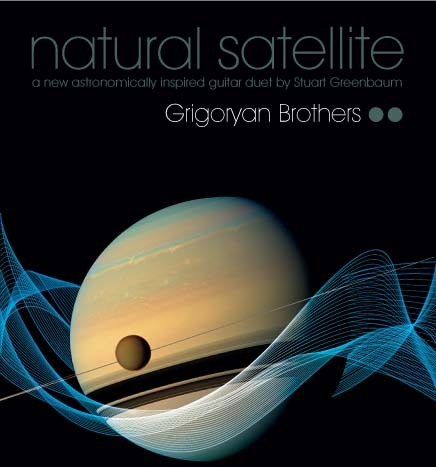 As a special treat to open APS 2014, Slava and Leonard Grigoryan are back at the Melbourne Planetarium for an encore performance of the astronomy-inspired guitar duet Natural Satellite. The event will be held at the Melbourne Planetarium at 8pm, Sunday 16th February. Composed by Dr Stuart Greenbaum, Head of Composition at the University of Melbourne, the five part work takes inspiration from the various moons of our Solar System. Dr Tanya Hill, Senior Curator of Astronomy at Museum Victoria worked with Stuart, Slava and Leonard to create an immersive astronomical experience to accompany the guitar-duet. Planetarium audiences will be treated to amazing close-up views of the moons of our Solar System, as they enjoy the stunning live music. Limited tickets have been made available for APS members attending APS 2014. Please register your interest via the google APS 2014 Conference Attendees sheet or contact Warik or Tanya directly. Additional tickets can be purchased online via the Planetarium’s What’s On. This entry was posted in Uncategorized and tagged APS 2014, Grigoryan Brothers, Melbourne. Bookmark the permalink.